It’s a long way from flying Aero Commanders for Geyserland Airways into the likes of Kaikohe, Auckland, Rotorua and Gisborne, to owning the airline of the Cook Islands… but that is the story of Ewan Smith, the owner of Air Rarotonga. The Cook Islands are located some 4 hours flying by jet from Auckland between Tonga and Tahiti. There are some 9,000 people living on the main island, Rarotonga with a total of some 15,000 on the 15 inhabited islands that cover some 2.25 million km2 of the Pacific Oceans that makes up the Cook Islands. There are three island groups - the southern group being the most populous, while the northern group has very small populations. Like many of the South Pacific nations the development of airfields in the Cooks was necessitated by the Second World War with airfields bring built at Rarotonga, Aitutaki and Penrhyn. Aitutaki was made famous as a stopping point on TEAL’s Coral Route service from Fiji to Samoa, Aitutaki and Tahiti that was operated by Short Solent flying boats. International flights began, however, in 1947 with the RNZAF and NZ National Airways Corporation operating to Rarotonga, the NAC flights operating from Whenuapai to Norfolk Island, Fiji, Tonga and Samoa. This service ended when the TEAL service started calling at Aitutaki, though this service Rarotonga without an air service much to the dismay of the Cook Island authorities. The Coral Route service ended in 1960 and the Cooks were without an air service until 1963 when Polynesian Airlines operated a DC-3 service from Apia to Rarotonga with TEAL purchasing all the seats. This service ended in 1966 when the 90-minute rule was brought into force, namely that if an aircraft lost an engine an alternate airfield was within 90 minutes of flying on one engine. The RNZAF introduced a replacement service using its Handley Page Hastings transport aircraft. Already, however, moves were afoot to establish an airport on Rarotonga capable of catering for jet aircraft. Until then Air Pacific and Polynesian Airlines Hawker Siddeley 748s were chartered to provide an air service to the Cooks. Flights starting using the Rarotonga International Airport on the 1st of December 1973 and it was officially opened by Her Majesty Queen Elizabeth II on the 29th of January 1974. The opening of the new international airport was also the impetus for another beginning, the establishment of the Cook Islands first airline and its first domestic air service. Cook Island Airways was established as a joint venture between Air New Zealand who owned 90% of the company and the Cook Island government who owned the remaining 10%. The primary focus of the company was to offer flights between Rarotonga and Aitutaki in connection with Air New Zealand’s Coral Route. Ewan Smith was appointed chief pilot and he was the ideal man to establish the airline and air service. Not only was he suitably qualified as the as the company’s chief pilot, he was also a licenced aircraft engineer having done his engineering apprenticeship with Aero Engine Services at Hamilton. This enabled him to ensure the company’s first aircraft, Britten Norman BN2A-21 Islander ZK-KHA (c/n C661) was maintained to a high standard. 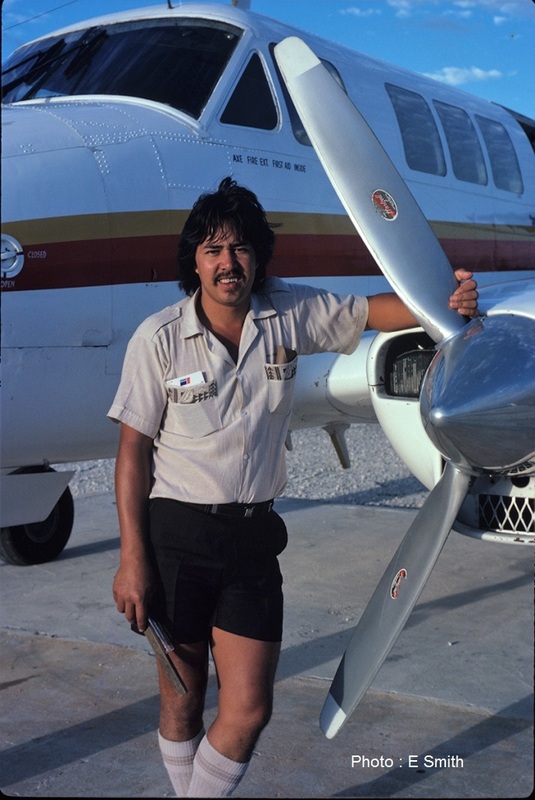 It was he who flew the company’s first domestic service between Rarotonga and Aitutaki on the 25th of November 1973. The service grew rapidly from 3 flights a week to 8 to 9 flights a week. Some two years later, on the initiative of Ewan Smith having been gifted the land, an airfield was built on the island of Aitu with the Cook Island Government providing a grader and two workers and the locals providing voluntary labour. 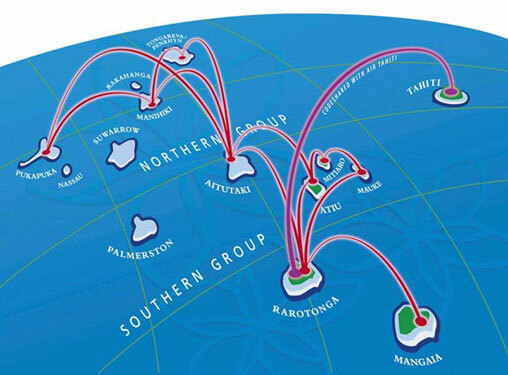 Airfields constructed using this partnership model followed on the islands of Mitiaro, Mauke and Mangaia. In the northern group an airfield was opened in 1994. A second BN Islander, ZK-KHB (c/n ) was added to the Cook Island Airways fleet in June 1978. While the Cook Island Government was happy with the developments of airfields on more of the country’s islands Air New Zealand was less than happy in providing an air service to them, the air service to Aitutaki being intended primarily to link to Air New Zealand’s Coral Route. With Cook Island Airways’s narrow focus Ewan Smith could see the potential for another airline to establish itself in the Cooks and in 1978 he went to see the Cook Islands’ Premier, Albert Henry, who instructed him to establish such an airline. Ewan went into partnership with Ross and Vara Hunter and Ian Rhodes, Air New Zealand’s station manager on Rarotonga, and they established Air Rarotonga in 1978. The company’s first aircraft was a Cessna 337F Skymaster, ZK-TAI (c/n 337-01456). The registration ZK-TAI came soon after the Civil Aviation Authority had started permitting personalised registrations. In Cook Islands Maori tai means the number one and it was also the name of one of Ewan’s best friends. Services began on the 7th of July 1978. Initially the company offered on-demand air taxi work but within a few months a scheduled service was established to the island of Mangaia and then to Aitutaki. The service to Aitutaki faced severe competition from Cook Island Airways who being owned primarily by Air New Zealand had a solid relationship with travel wholesalers. 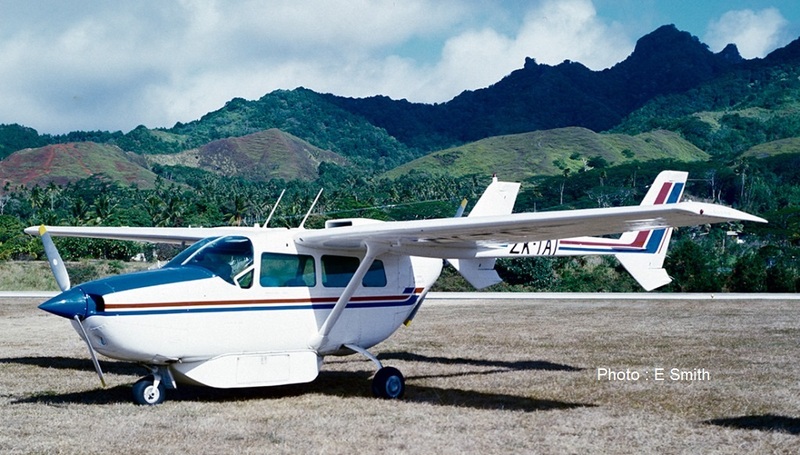 Cessna 172L ZK-NTP (c/n 1729994) was added to the fleet in September 1978 to offer flightseeing from Rarotonga. 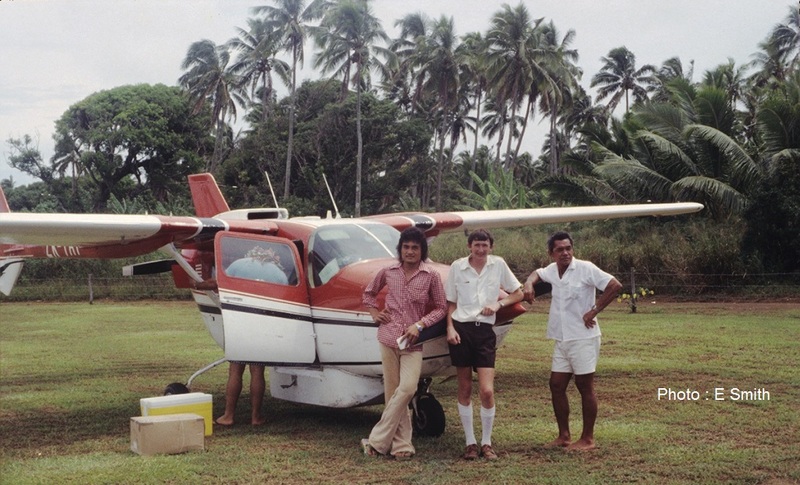 Munro Hockin with Jimmy Tearai and Tearai-Mokoro and Air Rarotonga's first aircraft Cessna 337 ZK-TAI on the island of Atiu. 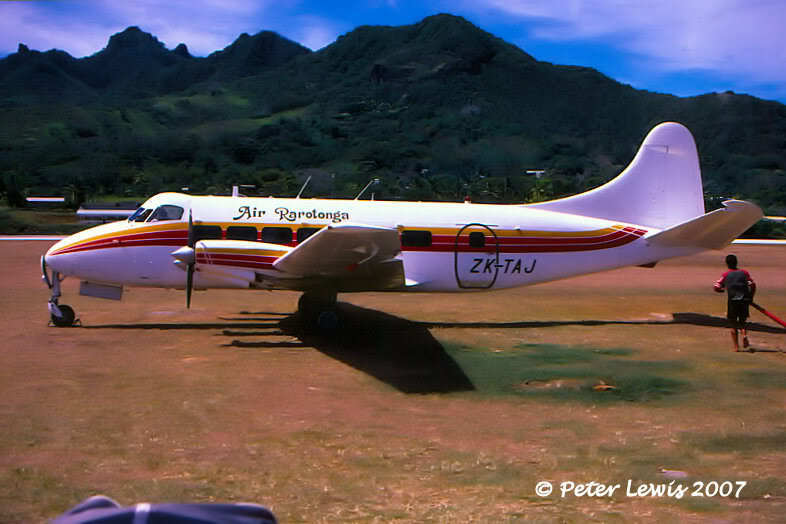 ZK-TAI again, though this time at Rarotonga after being repainted. A year after Air Rarotonga started operations Munro Hockin joined the company. He had been formerly been an instructor at the Rotorua Aero Club and with Ewan he has been with the company for most of the life of Air Rarotonga as a part owner. It was under his guidance that Air Rarotonga produced the professional pathway for Cook Islanders to enter the aviation industry as pilots. 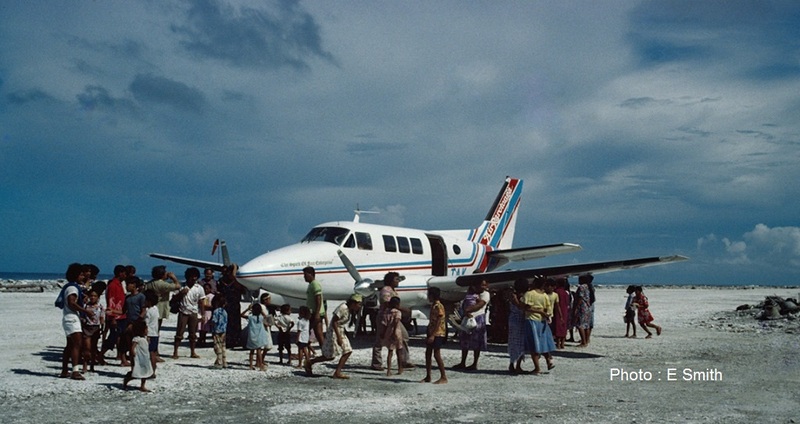 In 1980 the first hotel opened in Aitutaki and demand for flights increased leading to an 11 seat Beech B80 Queen Air Excalibur, ZK-TAK (c/n LD-324), being added to the fleet in 1982. The Queen Air had the same seating capacity as the Islander but it was more roomy and much faster. Within 18 months Air Rarotonga had made real inroads into the Aitutaki market and the increasing demand for this service necessitated another 10-seater being added to the fleet. This came in the form of a Piper Pa31-350 Navajo Chieftain, ZK-UTA (c/n 31-7752127), which was leased from Tonga Air Services. The arrival of Beech Queen Air ZK-TAK at Rakahanga creates a lot of local interest. 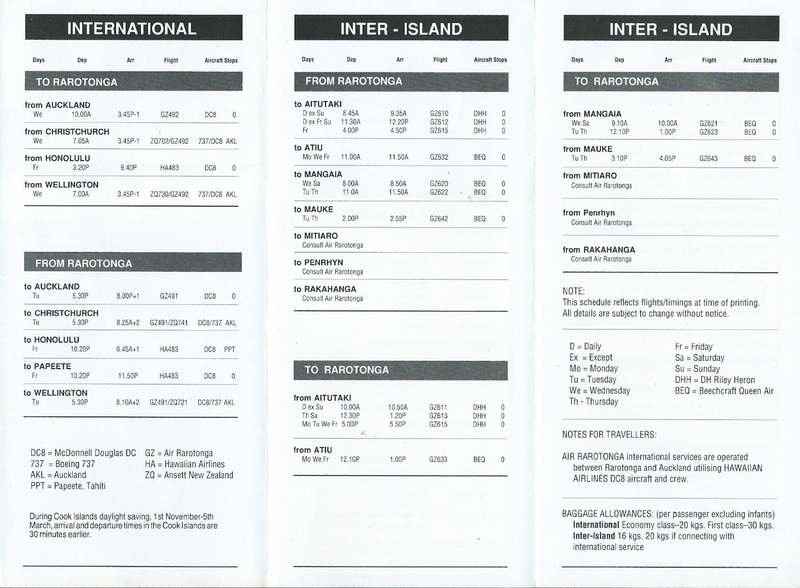 The April 1985 issue of NZ Wings records Ewan as saying We operate a timetable to the southern group of islands with 4 or 5 flights a day to Aitutaki in the high season. To the other islands, Mangaia and the three islands close together, Atiu, Mitiaru and Mauke, we operate normally on Monday/Wednesday/Thursday/Friday — with additional flights on demand. Charter flights are flown around the southern group with two twins and the occasional charter goes to Tahiti or the northern group. However, all Ewan’s hard work to develop Air Rarotonga was put into jeopardy with the Air New Zealand cabin crew strike of Christmas 1985. Faced with its tourist passengers not being able to get to and from Rarotonga Ewan made an incredibly risky decision. Colin Hall’s book, Coming in on a Jet Plane, tells the story. Air Rarotonga was close to a ‘survival situation.’ Christmas was normally excellent for business they could see it ‘going down the drain.’ Borrowing twice as much as the company was worth from the bank in the middle of the night they chartered a Hawaiian Airlines DC-8 and began flying between Rarotonga and Auckland. They shifted their traditional passengers for their own transfer flights – and survived. Air Raro just covered their costs, making $5,000 out of a $220,000 cost, but the impact was much greater than anyone could have foreseen. As a result of the strike the Cook Island premier Thomas Davis approached the New Zealand Government saying that the strike had effectively held the Cook Islands to ransom and such a situation could not happen again. Prime Minister David Lange agreed and this led the way for control and ownership of the airport at Rarotonga being passed to the Cook Island Government and the Cooks were also given bilateral air service rights between Rarotonga and Auckland. These rights led to Ansett approaching the Cook Island Government and the formation of Cook Islands International, the Cooks own airline but managed by Ansett. The airline did not last long but when it folded Air Rarotonga took up the rights and for two years operated its own international service with flights to Auckland and Honolulu using chartered Hawaiian Airlines McDonnell Douglas DC-8s and Lockheed L1011 Tristars. Meanwhile, on the domestic front, Air Rarotonga continued to flourish. Loadings on the Aitutaki service required both Air Rarotonga's Queen Air and Chieftain to both fly the same schedules so in July 1986 a 15-seat Riley conversion de Havilland DH114 Heron, ZK-TAJ (c/n 14131), was added to the fleet. From early 1988 to mid-1991 six-seat Beech 58 Baron ZK-ECA was part of the fleet. By this stage Air Rarotonga had gained two thirds of the market share on this route as the battle for traffic with Cook Island Air continued. The success of the Heron proved to Air Rarotonga the potential of the route. However, the Heron was elderly and a more modern aircraft was needed and this led to the introduction of the first 15-seat Embraer EMB-110P1 Bandeirante ZK-FTS (c/n 110239) in June 1989. 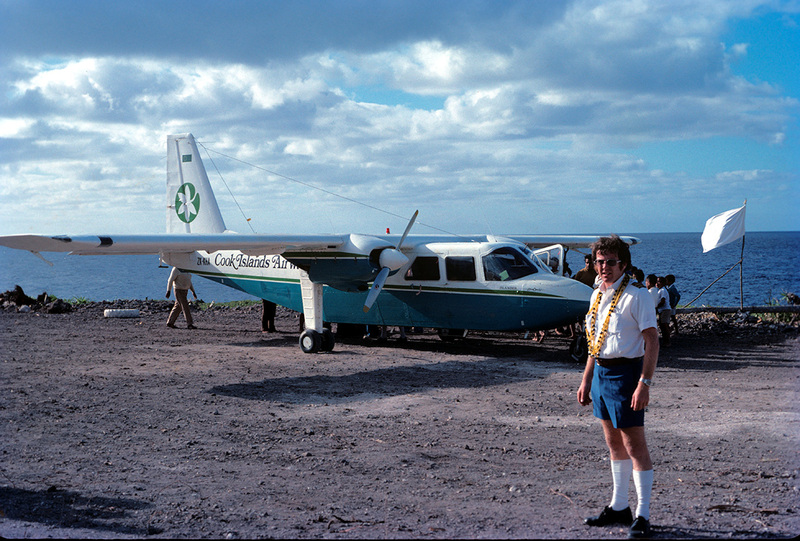 Cook Island Air's responded and replaced its BN Islanders with a De Havilland Canada Twin Otter ZK-KHA in August 1989. Once again the Air Rarotonga’s aircraft outperformed Cook IslandAir’s in speed on the 260km flight to Aitutaki. This was an air war that could not last. In 1991 Air Rarotonga entered a truce with Cook IslandAir’s owner Air New Zealand. Air Rarotonga bought out Cook Island Airways and in turn agreed that it would not operate international services. 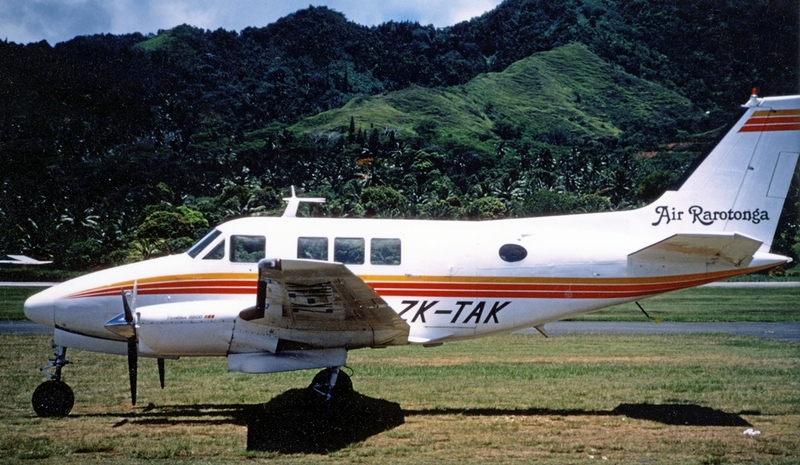 With Air Rarotonga now carrying all the tourist traffic to Aitutaki it needed another aircraft and it purchased a second Bandeirante, ZK-TAI (c/n 110387), in December 1991. Over the 1990s traffic continued to grow in in August 1998 a third Bandeirante, ZK-TAK (c/n 110448) was bought. 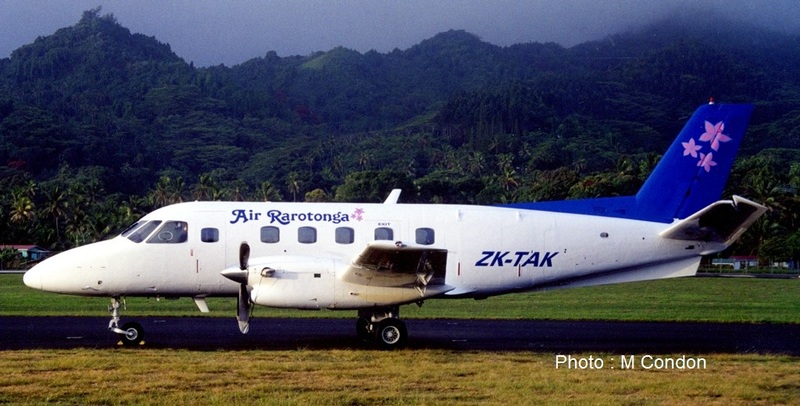 In June 2000 Air Rarotonga made $6 million investment with the purchase of a 34-seat Saab 340A ZK-EFS (c/n 49). Air New Zealand Link operator Air Nelson was contracted to provide initial flight and technical training and support as well as providing training for the flight attendants. The Saab is used solely on the prime Rarotonga-Aitutaki service. 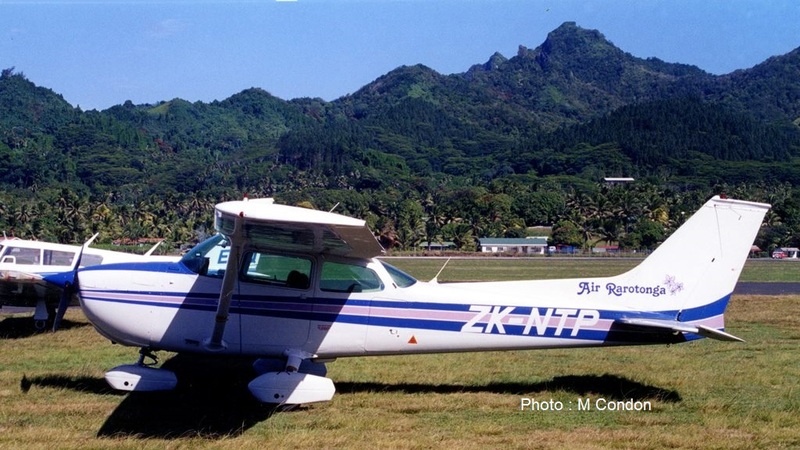 The Saab, the three Bandeirantes and Cessna 172 ZK-NTP make up Air Rarotonga’s current fleet. On the 1st of June 2005 all the aircraft were taken off the New Zealand ZK- civil aircraft register and placed on the new Cook Islands register. All the registrations remained the same but with the Cook Islands E5 prefix. Bandeirante E5-TAI was retired in February 2008. A replacement Bandeirante arrived from Australia in February 2012 and this was also registered E5-TAI (c/n 110447) with it entering service in July 2012. At the same time another Bandeirante was purchased for use as spare parts. On the 3rd of April 2007 Air Rarotonga and Air Tahiti commenced a weekly code-shared service between Papeete and Rarotonga using Air Tahiti’s ATR-42 or ATR-72 regional turbo-prop aircraft. Perhaps one of the most significant moments in Air Rarotonga’s history is when it entered a code share agreement with Air New Zealand on the Rarotonga-Aitutaki route in May 2007. This means tourists can fly all the way to Aitutaki on one ticket and it also has Air New Zealand serving a port of historic significance going back to the flying boat days. When the company purchased the Saab it also purchased a Saab 340 technical deal from Air New Zealand. This means routine checks and maintenance are done at Rarotonga but every three years the Saab flies to Nelson for a three-month long major check. 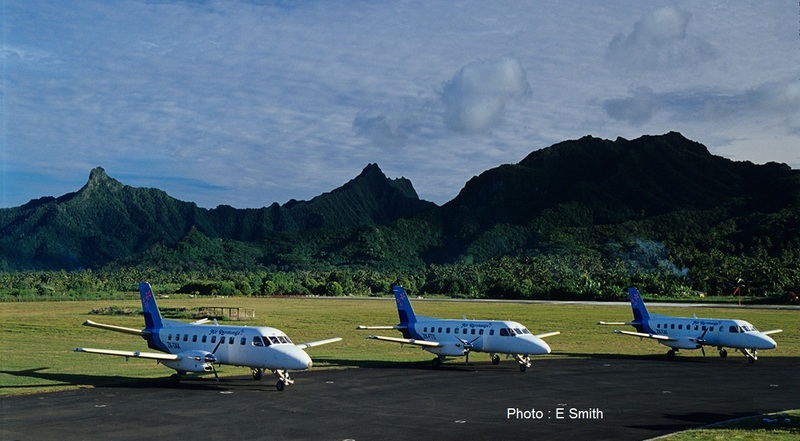 Air Rarotonga have also provided ground handling for a number of airlines that have served Rarotonga including Aloha, South Pacific Island Airways, Royal Tongan, Polynesian, Hawaiian, Pacific Blue and Air Tahiti. Another important change for Air Rarotonga is the development of GPS. Prior to GPS there were only two NDB radio beacons on the outlying islands, one beacons at Manihiki, which Air Rarotonga installed itself, and the other at Penryhn. This meant navigation to the outer islands involved a lot of skill. The advent of GPS has allowed published air routes and the establishment of GPS instrument approaches at all the outlying airfields at Aitutaki, Atiu, Mangaia, Manihiki, Mauke, Mitiaro, Penrhyn and Pukapuka. The GPS alone, however, does not help the logistical problems Air Rarotonga faces. Distances are huge. A Bandeirante flight to Manihiki, for example, has first to fly 142nm north to Aitutaki to refuel. It then has a 510nm flight to Manihiki. Carrying alternate fuel for Aitutaki means it can only carry 8 passengers. The plane then has to refuel at Aitutaki on the flight south to Rarotonga. The alternate is taking a passage on one of the two small ferries as deck cargo on a journey which might take up to a week. It is not surprising that flying to the northern group is not cheap. Nonetheless the Bandeirante is ideal for the Cooks. With no 18-seater currently on the market there is no possibility of replacement in the foreseeable future and so Air Rarotonga have recently installed new engines of its Bandeirante fleet. Air Rarotonga's original Bandeirante shown in its Cook Island markings of E5-FTS at Rarotonga on 26 May 2014. Another factor that makes air travel to the outer islands expensive is the high overheads Air Rarotonga faces. It receives no subsidy from the Government for its services while in 2011 Air Rarotonga it paid $800,000 for the use of Cook Islands airports. Landing fees at Rarotonga are among the highest in the world due to the small number of flights. While I was in Rarotonga there were 15 scheduled international flights - Air New Zealand operated nine flights to Auckland, one flight to Sydney and one to Los Angeles, Virgin Australia operated three flights to Auckland and Air Tahiti operated one flight to Papeete. 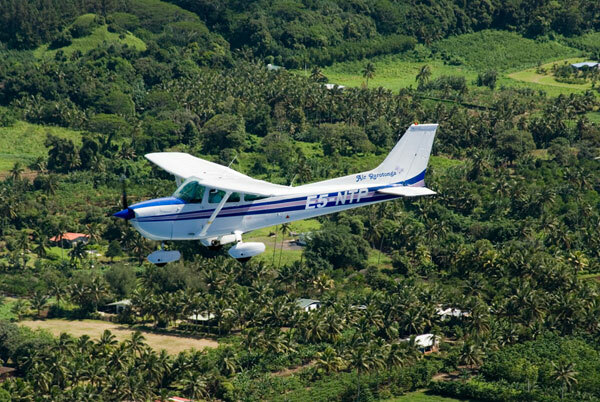 Domestically Air Rarotonga operates the Saab daily up to Aitutaki with at peak season up to five flights a day. 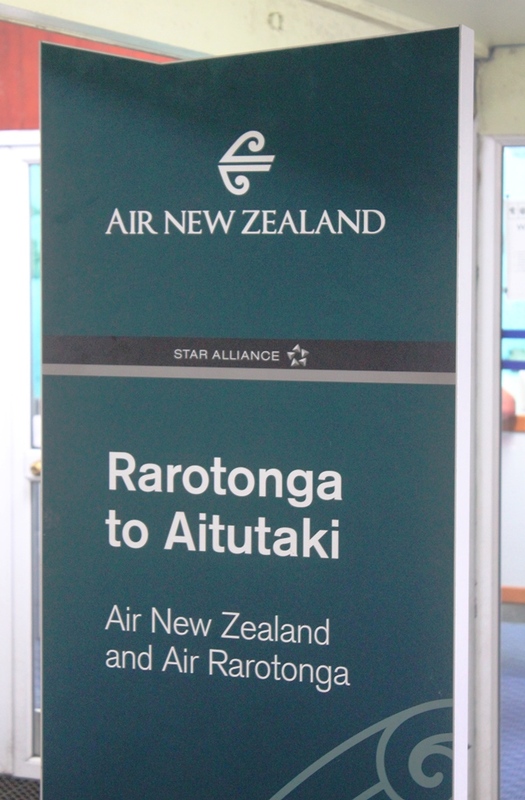 Atiu is linked Monday to Saturday to Rarotonga with some flights each week to Aitutaki. Mitiaro and Mauke share two to three flights a week to Rarotonga. Mangaia has direct flights most days to Rarotonga. There is also a weekly flight to Manihiki. Air Rarotonga offers charter flights to Pukapuka and Penryhn. Likewise Air Rarotonga has found the Saab ideal for its service to Aitutaki and likewise there is no comparable size aircraft being built. Saab have recently released a 25 year fleet-proving programme to ensure the on-going maintenance of their aircraft and so this makes maintaining the Saab an attractive proposition for the airline. Underneath the Air Rarotonga logo are the words, Airline of the Cook Islands. Since founding Air Rarotonga over 35 years ago Ewan Smith has insisted on a standard of excellence in all aspects of the airline’s operations. That standard of excellence has been reinforced by chief pilot Munro Hockin who is now the only pilot not from the Cook Islands… but as one of the pilots said to me Ewan and Munro have been here so long they are Cook Islanders! With such high standards it is not surprising that Air Rarotonga pilots have gone on to fly for Air New Zealand, Cathay Pacific, Fly Dubai, and other jet operators. The company is also a proud sponsor of the local community with its sponsorship of many sporting and cultural activities in the Cook Islands. Saab 340 E5-EFS on turnaround at Aitutaki on 23 May 2014. While numerous airlines in the Pacific have come and gone Air Rarotonga, with its standard of excellence, has survived and flourished offering the islands of the Cooks a service that has grown with and has been instrumental in developing the country’s tourism industry. It has a 36-year history of which Ewan, Munro and the Air Rarotonga team can be truly be proud. Air Rarotonga is a fantastic sponsor of Te Vaerua a community group providing physical rehabilitation to Cook Islands. They often ferry wheelchairs and other equipment free of charge to the outer islands. They also offer great fares to the therapists when travelling to the islands to conduct rehabilitation clinics. This is the only access that the people in the outer islands have for services such as these. Thank you Air Rarotonga.